Sweet Peas and Pumpkins: Up for some April Fool's Day fun? Originally I was going to post on April Fool's Day about how I've created a brand new recipe from the food you sweep up off the floor. People, we end up with a lot of food on our floor. Maybe it's just where we are in life, but I feel like we could easily create "floor trail mix" most times after I sweep. A gentle shake in a colander to get out all the dirt, and I could take the remaining cereal, crackers, nuts and dried food pieces to create a brand new recipe. And bake for about 20-25 minutes. Need a good recipe? 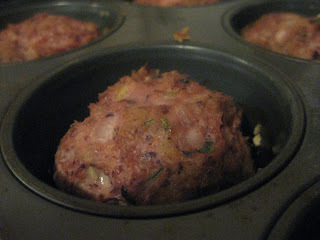 May I suggest this Barbecue Chicken Meatloaf? After you remove the meatloaf, top with some mashed potatoes. I've found that using cream cheese in the mashed potatoes helps them hold their shape. Finally, add an asparagus spear. 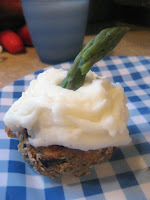 The first time I made this, the boys ate the asparagus right up, I think partly because they were so tickled by having a "cupcake" for dinner.